For most people, the most enjoyable pictures you will use in Photoshop Elements are those of family and friends. You may take photos of landscapes and wonderful places, but quite often you’ll ask someone to stand in front of the Coliseum, Louvre, Grand Canyon, or other notable landmark. For just that reason, Photoshop Elements makes it easy for you to identify, sort, and view pictures with people. 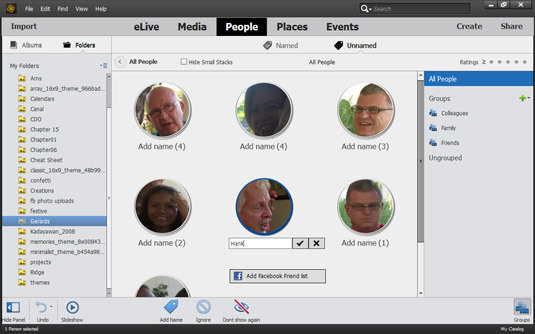 A marvelous improvement to face recognition has been added to Elements 14. 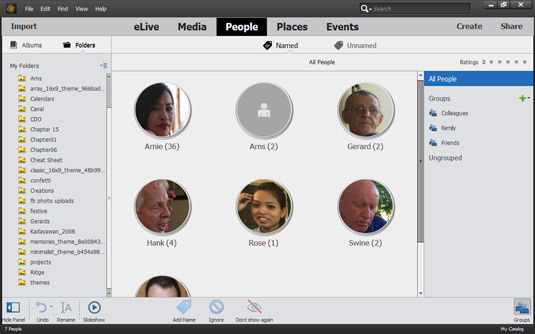 Although face recognition itself is not new to Elements, the way people are recognized has been completely overhauled and we’re sure you’ll like this new approach to naming all your friends and family. When you import images, Elements immediately begins an attempt at naming people you’ve previously tagged with names. If it’s your first attempt, you find a cluster of unnamed people presented to you in a completely new window. Click Add Name and type the name of the person identified with the photo. To name a person, click Add Name and a text bar opens where you type a name. At the top of the People window, you see Named and Unnamed. To view the people you have tagged with names click the Named text. The window changes to display all those you have tagged with names. Click Named at the top of the People window, and you see all the people you’ve tagged with names. 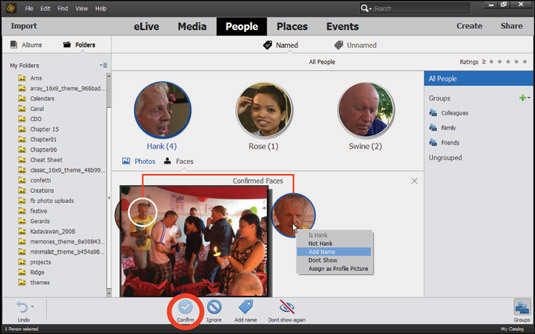 Now here’s the nifty part: Quite often, Elements sees a person at a distance in a photo and attempts to tag the person with a best guess. When you see the face, you may not be certain if the tag properly matches the person. Just place the cursor over the face, and a small image appears with the entire photo. This can help you identify where and when a photo was taken. You can confirm the guess Elements made by right-clicking the face, where Elements guesses that the person in the photo is Hank. If it’s not Hank, click Not Hank in the menu. If it is Hank, click Confirm at the bottom of the window. Right-click a face to open a menu or click Confirm if the guess made by Elements is correct. Another nice new feature added to face recognition is an option to Hide Small Stacks. 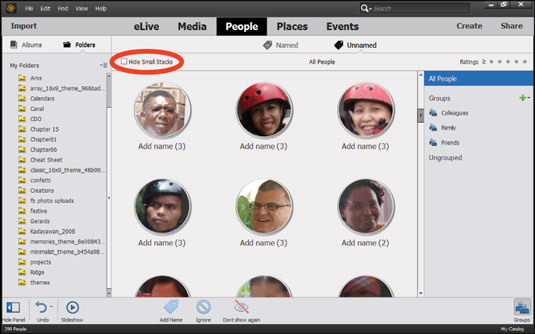 When you click the People tab in the Media Browser and click Unnamed, Elements displays all the people in your catalog along with the number of occurrences of a given person. Some faces may appear only once, and they may be faces of unknown people in your photos. When you check Hide Small Stacks, all the single faces disappear from your display. You can easily disregard the least important faces and focus on those people you want to tag. Check Hide Small Stacks to eliminate from view single faces.